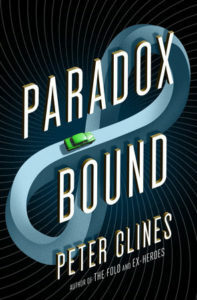 I recently read and loved Paradox Bound (see my review here), which was described to me as “a wildly fun sci-fi novel” and “National Treasure meets Doctor Who” and actually lived up to that description. I was excited to have the opportunity to interview author Peter Clines and give away two copies of the book! I hope you enjoy the interview. For instructions on how to enter the giveaway, please see the bottom of this post. Hi Peter! Thanks for taking the time to answer these questions. No problem at all. Ask me your questions, bridgekeeper. I’m not afraid. I really liked Paradox Bound but I haven’t read any of your other books (yet). 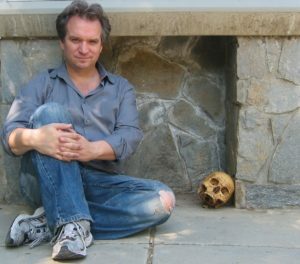 Is Paradox Bound representative of the kinds of books you write? Is there anything that you’ve done in Paradox Bound that you haven’t done in previous books? Maybe? Sort of? It’s kind of a broad question. I like doing lots of different things, so my stories tend to be balancing on this three-way tightrope. Sometimes they’re a little more sci-fi, sometimes a little more creepy, sometimes a little more action-adventure. Some lean a little more this way, some lean a little more that way. And I like to think they all have a few nice, believable funny moments in them. So I guess it’s representative that way. As for things I haven’t done before… well, hopefully a lot of it. I’ve never done something with this much historical research behind it, which was kind of fun and intimidating and overwhelming all at once. One of the things that I loved about Paradox Bound is that it told a satisfying self-contained story but it had such a cool world and mythos. Are you planning to set any more stories in the same world? Well, I’ve kind of stumbled into this sort of MCU/ Stephen King sort of place where a lot of my stories share loose connections. Fans of my other books probably caught an easter egg or three in Paradox Bound. So I think it’s likely we’ll see some of the characters from this book again, but maybe not so much a direct sequel. Does that make sense? As an immigrant and recent American citizen, the idea of searching for the American Dream really resonates with me. What inspired you to come up with the object of Harry and the other searchers’ quest in Paradox Bound? One of the original inspirations for this was Neil Gaiman’s Neverwhere. It’s got so many clever takes on London. The different place names and sayings that are unique to it. And it struck me on my, I don’t know, hundred-and-eighth reading or something, that no one had ever done something similar, an American version, so to speak. It became an idea I played with on and off for a while until I got it all to sit right. But one of the early ideas that came to me was the term “the American Dream.” What if all the stories about people searching for the American Dream weren’t just clever metaphors? What if it was an actual quest that people were on? Did you do any historical research for Paradox Bound? Are there events or people that you would have liked to include that didn’t end up fitting within the story? So much research. So much of it not used. It’s just the nature of the beast. There was a ton of stuff I found and wanted to use, but couldn’t make it fit. There was also stuff that didn’t fit, so I tweaked history for story purposes… although I only did that once or thrice. I couldn’t help imagining a movie version of Paradox Bound as I was reading it. You’ve mentioned in other interviews that you watch a lot of movies. How does that influence your writing? Watched a lot and worked on a lot. Movies are a very different storytelling medium, but I think there are a lot of aspects to storytelling that are universal. It doesn’t matter if I’m telling the story as a book, as a movie, as a comic book, whatever. So there were things I definitely learned about storytelling by working on movies—most notably what you do and don’t need to tell the story. So often I’d see people doing redundant, unnecessary work, either in the script or on the screen. And there are still things I learn watching bad movies. I’m a big believer that you can learn more from mistakes than you can from perfection. If you had to cast a Paradox Bound movie, who would you choose? I’m always awful at these, just because my experience tends to make me a bit overly realistic (or perhaps “cynical”) about such things. It’s only slightly more plausible than an alien invasion. Besides, I always get a kick out of hearing how other people see the characters (even if I find some of their choices kinda baffling). My writing process is a mess. No one should follow it or use it as an example. Seriously, though… I’ve been trying to outline a little more these days. I still leave myself lots of room, but I try to have the beginning, end, and a few major stops along the way all marked out before I get going. I was having some health issues for a while that really slowed me down, but now I’m back to about 2000 words a day. I try to keep it to a nine-to-five schedule, but I’ll go later if I need to. I think first drafts are great, just the “anything goes” aspect that lets you spew ideas out on the page. But I also love editing. Seriously, I get a great joy out of going through a story line by line, reviewing the dialogue, examining word choices. I love my job, is what I think this boils down to. So many things. Almost every book I’ve worked on has something like that. Hell, there are things I’d change on Paradox Bound. just in the months since I finished working on it. In theory, we keep learning, figuring out how to do things better, so it’s always possible to look back and think “Oh, it would’ve been better if I’d done this instead of that.” It doesn’t necessarily mean what’s there is bad, it just means we’ve learned a cleaner, more direct way of doing the same thing. That’s the goal, really. To keep improving, for the next book to be better than the last book. Not really. I’ve always disliked that whole “oh, the characters guided me, they went in a different direction,” mindset. Writing is work. It takes effort, and all that effort comes from the writer. Nowhere else. Now, that being said… I have had points where I’m writing and I realize the little changes and adjustments I’ve made along the way have guided the book in a new direction. But this isn’t “the characters” doing anything. It’s just me having an understanding of plot and story and structure and realizing the book needs to change to make logical sense. I want one of those magic pocket watches that grant you an extra hour of time every day. Are those still a thing? Where can I get one of those…? Has always wanted to meet me? Hmmmmm. I don’t know. When you put it that way it seems a little… weird, for some reason? There are a couple who I’d just be thrilled to know they read something of mine and found it mildly entertaining. I was thrilled when I heard F. Paul Wilson liked one of my books, and we got to meet when he was signing here in LA a while back. G. Willow Wilson, maybe? I grew up in New England, so Stephen King’s just a given. Clive Barker? My husband and I have been watching a movie a day for about two years now and I’m always looking for new movie recommendations. What have you been watching lately? It’s October so I’ve been watching tons of horror/creepy movies. Well, not tons. I’m behind because of New York Comic-Con. Paranorman is wonderful, and so are Coraline and The Addams Family. I have a goofy love for Jason X. There’s classics like The Omen and Halloween and The Car. Hellraiser’s another favorite. Plus, like I was saying before, I’m always watching bad movies on Vudu and usually dissecting them live on Twitter. Just discovered a little collection there of bad horror movies hosted by Elvira. Okay, that’s a new one. I think I’d probably go with some kind of lizard man. I was scared of the Sleestaks when I was a kid, and that grew into an odd fascination later. Loved them as D&D monsters. My first real story, back in third grade, was about lizard men from the center of the Earth. So let’s say a lizard man armed with Captain America’s shield (or its native fantasy-world equivalent). That’s probably good for some fan art, right? If you could have Eli and Harry from Paradox Bound team up with a fictional character from another universe, who would you choose and why? Oh, there’s so many fun possibilities. The obvious answer is Doctor Who, but I’m going to be a little more obscure and go with the Lifeboat crew from Timeless. I think there’d be a lot of opportunities for fun there. This is the part where I tell people to please check out Paradox Bound., right? Okay… that. Check it out. Paradox Bound‘s publisher Crown has graciously let me give away two copies of the book! To enter, please email me at kriti@justaworldaway.com with subject Paradox Bound and your name and mailing address (US only, sorry!). This giveaway is open until Dec 15, 2017. Note on privacy: I will not be using your email address or mailing address for any purpose other than this specific giveaway. If you win, your mailing address will be forwarded to the book’s publisher (Crown, in this case) so that they can mail you the book, but they won’t ever see your email address.